As the service spreads across businesses worldwide, Slack UK head reveals just why the future looks so bright. As more and more workers take up flexible working, the need to stay connected with your team is higher than ever. Real-time communication can be the key to ensuring a winning work formula, and Slack, with its six million daily active users, has quickly grown to become one of the world’s most popular communication tools. 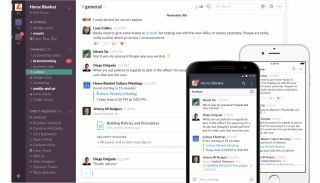 ITProPortal recently spoke to Stuart Templeton, Slack’s UK head, about the company’s plans to grow and prosper here, and what benefits it offers to businesses big and small. Templeton met us at Slack’s impressive new UK headquarters in London’s swanky Fitzrovia district. Opened in March as the first dedicated UK office for Slack, the office is a stunning mix of Silicon Valley cool and bright and airy design - the perfect home for the company to expand and grow its UK presence. Currently, Templeton heads up a team of 12 in the UK, mainly customer-facing roles such as sales and client management, but he is ambitious about growing the team soon - which considering its impressive UK client list, should be a straightforward task. Templeton notes that the UK is already Slack’s second-largest market, with over 15,800 companies using the service here, including the likes of ITV, Centrica, Ocado, Marks & Spencer and The Times. This roster of clients led to UK revenues growing 80 per cent over the past year (with London itself growing 74 per cent) but Templeton is not content to sit on his laurels. "As companies get bigger, the business challenge becomes greater," he notes, "if you’re going to deliver on whatever transformation goals you’ve been working on, you need teams to be aligned, your culture to be aligned, and the bigger the company, the bigger the challenge." He notes that a “significant proportion” of Slack adoption in the UK has been via word-of-mouth, particularly among the large enterprise sector, which is increasingly seeing the benefit of keeping workers connected. The launch of Enterprise Grid earlier this year, which offers a smarter, more collaborative way for workers in a large business to communicate, has greatly helped this growth, with Templeton describing the launch as “really changing the game for Slack at an enterprise level”. Slack now boasts over two million paid-for customers globally, which is only set to increase as word of mouth continues to do its job. The company is heavily investing in AI and machine learning, as Templeton notes, Slack is, “a natural buyer of AI”. The service’s use of chatbots has been revolutionary for many of its customers, acting in many cases as their first experience of the technology in the workplace. Templeton notes that the goal is that the service becomes everyone’s chief of staff, providing a quick and easy way to see the communications that you need. He adds that he believes communications services such as Slack will become the norm within the next few years, greatly reducing the reliance on email services as real-time collaboration become ever-more crucial to business success.